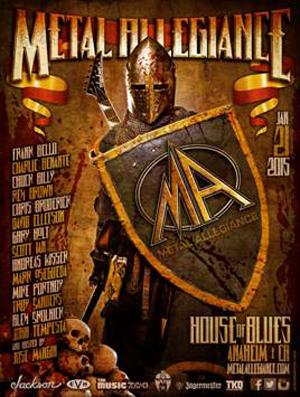 METAL ALLEGIANCE, the all-star band consisting of some of metal's finest musicians, played a show in Anaheim, California on January 21st at the House of Blues. If you missed this epic event you can now check it out below because the entire set is now streaming! "A gift for all of you who are snowed in or were unable to make it to this colossal metal event last week. The mix isn't perfect (try mixing 15 different musicians on the fly! ), but the energy and spirit of \m/etal surely is!"